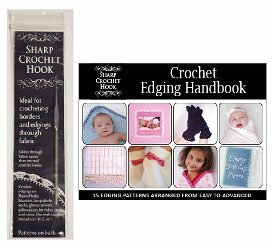 Blankets, gloves, socks, pillowcases, and even paper crafts can have a beautiful crocheted edge with the Sharp Crochet Hook tool. The Sharp Crochet Hook is a great tool for anyone who loves a frilly soft edge to their various projects. This unique hook has a sharp point right above the hook, so it’s easy to push it through fabric, burlap, and paper. Included with this tool is a small book of 15 edging patterns, arranged from easy to advanced. Even the easiest of patterns looks like it was done by a pro! The “So Sweet” pattern, for example, is great for intermediate crocheters and would look beautiful on an afghan or a pair of gloves. For those who like a good challenge, the “Heaven in Bloom” pattern teaches you to create a beautiful border of crocheted flowers, which would look cute on a baby blanket or a spring lace tablecloth. Don't bother ordering this. I ordered 2 hooks and they arrived bent out of shape and with metal shavings in one of the plastic zip lock bags. Tried to contact company and no reply. Will file a claim with my credit card company. They didn't appear to have a sharp edge to the hook, either.